George Washington Muir enlisted in The Australian Imperial Force 26 Apr 1915 at Clairmont, Tasmania Australia rising from the ranks to Lieutenant upon his discharge on 19/9/1919. He served in Gallipoli and France and was wounded twice. George Washington Muir enlisted in the Australian Imperial Force on 26 April 1915 and served until the wars end and his discharge on 19 September 1919. He served at Gallipoli and France and was wounded Twice. He was promoted from the ranks and obtained the rank of Lieutenant by wars end. First World War Nominal Roll Page - AWM133, 38-044 - George Washington Muir. Lieut George Washington Muir embarked with 12th Battalion 26.4.1915 and Returned to Australia (date left for Australia) 15.5.1919. The 26th Battalion was raised at Enoggera, Queensland, in April 1915 from recruits enlisted in Queensland and Tasmania, and formed part of the 7th Brigade. It left Australia in July, and, after training in Egypt, landed at Gallipoli on 12 September. At Gallipoli, the 26th played a purely defensive role and at various times was responsible for the defence of Courtney?s and Steele?s Posts, and Russell?s Top. It withdrew from the peninsula on 12 December. After the withdrawal from Gallipoli, the 12th Battalion returned to Egypt and, in March 1916, sailed for France and the Western Front. From then until 1918 the battalion took part in bitter trench warfare. The battalion?s first major action in France was at Pozières in the Somme valley in July 1916. After Pozières, the battalion fought at Ypres in Flanders and then returned to the Somme for winter. In 1917 the battalion took part in the brief advance that followed the German Army?s retreat to the Hindenburg Line. For their valorous actions near Boursies during this advance, Captain J. E. ?Jim? Newland, commanding A Company, and Sergeant J. W. Whittle were each awarded the Victoria Cross. The battalion subsequently returned to Belgium to participate in the offensive that became known as the Third Battle of Ypres. In March and April 1918 the battalion helped to stop the German spring offensive, and later participated in the great allied offensive of 1918, fighting near Amiens on 8 August 1918. This advance by British and empire troops was the greatest success in a single day on the Western Front, one that German General Erich Ludendorff described as ?the black day of the German Army in this war?. The battalion continued operations until late September 1918. At 11 am on 11 November 1918, the guns fell silent. Soon after, the members of the AIF began to return to Australia for demobilisation and discharge. George Washington Muir was buried 27 February 1943at the Cornelian Bay Cemetery, Newtown, smania, Australia. His grave is located in the Church of England Section FF, Site Number 286. Headstone of George Washington and Eunice Bertha Muir (n.
[S64] World War I Military Service Record, Australian Government, (Australian National Archives), 1 - 50 (Reliability: 3), 26 Apr 1915. [S202] Australian War Memorial (Reliability: 3), 12 Sep 1915. [S202] Australian War Memorial (Reliability: 2), 24 Aug 1916. [S64] World War I Military Service Record, Australian Government, (Australian National Archives), 50 (Reliability: 3), 1924. [S201] Millingtons Southern Cemeteries (Reliability: 3), 27 Feb 1943. George Washington Muir was buried 27 February 1943 at Cornelian Bay Cemetery, Newtown, Tasmania, Australia. His Grave is located in the Church of England, Section FF, Site Number 286. 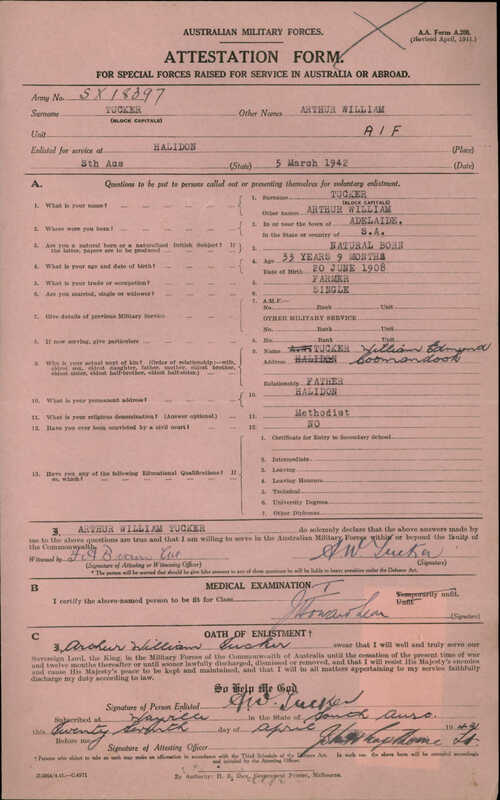 [S64] World War I Military Service Record, Australian Government, (Australian National Archives), 47 (Reliability: 3), 1970.